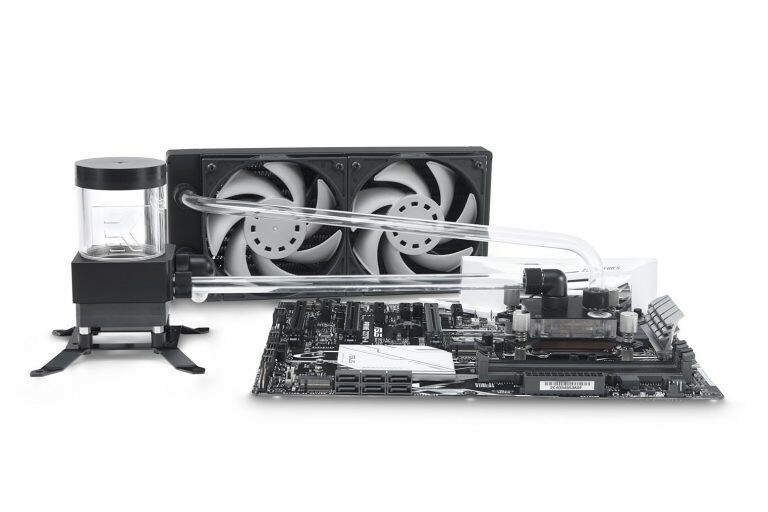 EK Water Blocks, the premium liquid cooling gear manufacturer, is introducing its newest line of popular EK Kits, the Hard Tubing kits. These kits are a great choice for enthusiasts who are looking for a complete high-performance hard tubing liquid cooling solution and don’t want to purchase everything peacemeal. EK-KIT HT240 and EK-KIT HT360 beside the very compatible thin EK-CoolStream SE radiator that they use will also be very suitable for low noise scenarios. As we know, slim radiators benefit from low-speed fans more than the thick ones, and the 120 mm fan format only adds additional cooling surface. 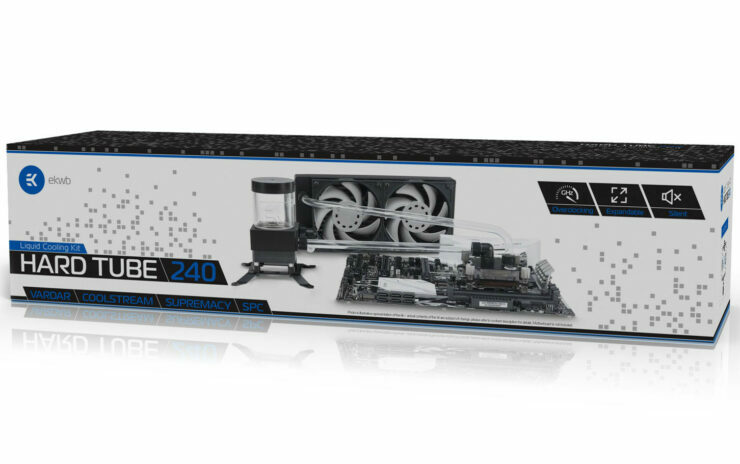 The EK-KIT HT240 is a complete hard tubing liquid cooling kit dedicated to users who seek top performing market proven components with versatile case compatibility in focus. Designed for cases with limited radiator space in mind, the HT kit is a great choice for liquid cooling enthusiasts who are looking for a complete high-performance hard tubing cooling solution. 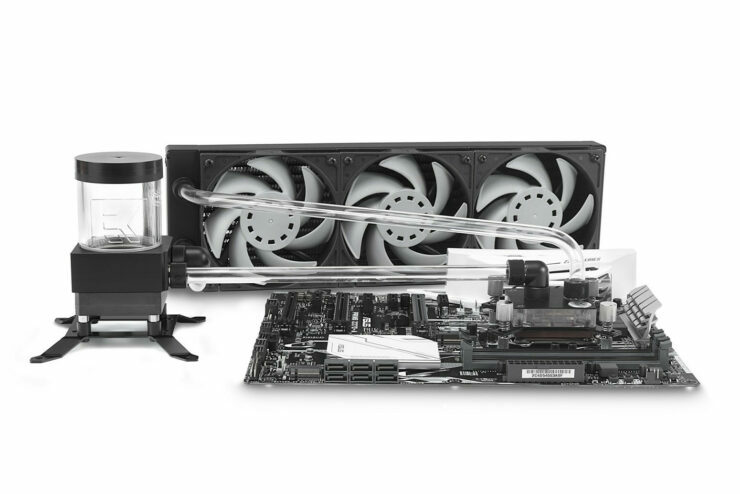 This kit brings everything you need to assemble your custom liquid cooling loop. You don’t have to worry about compatibility issues or matching the fitting and tubing size. If you are looking for a quick access to the world of premium liquid cooling, this is your entry ticket. The end result is a beautiful looking hard tubing liquid cooling loop that is also ready for a future upgrade. EK-Supremacy MX UNI – a CPU water block that fits all modern CPU sockets like Intel LGA 115x, Intel LGA 20xx and AMD AM4 with a universal mounting mechanism that offers error-preventing, tool-less installation. The result is an easy installation which brings perfect performance every time. The EK-CoolStream SE radiator (EK-CoolStream SE 240 and EK-CoolStream SE 360) – offers best cooling capacity in the sub 30mm thick radiator class: copper fins provide massive surface area while the parallel flow cooling chambers reduce hydraulic flow resistance to a minimum. Built for EK-Vardar 120mm high static pressure fans, these radiators are optimized for maximum heat dissipation across an entire fan operational range, thus delivering exceptional performance at both low- and high airflow operation.EK-Vardar F3-120 (1850rpm) – industrial grade high-static pressure computer cooling fan, designed and built primarily for high-performance computer liquid cooling systems. EK-Vardar is simply the best choice for computer radiator cooling as it provides unmatched performance throughout the entire operating range. Two 120mm Vardar fans are included with EK-KIT HT240 and three 120mm Vardar fans are included with EK-KIT HT360. EK-XRES 100 SPC MX PWM (incl. pump) – is a value-oriented water cooling pump reservoir combo. Co-engineered by EK Water Blocks, it has been designed to lower the production costs yet still offer premium hydraulic performance at the best price. PWM control allows for automatic pump speed regulation depending on your CPU temperature. Full performance on demand or whisper quiet operation in idle mode. EK-CryoFuel Clear – is a specially designed additive for computer liquid cooling systems. It comes in a weight-saving 100mL concentrated form, which just needs to be diluted with 900mL distilled water (not included). The diluted liquid forms a stable non-toxic mixture for your liquid cooling loops and contains all the necessary corrosion, scale, and biological growth inhibitors. 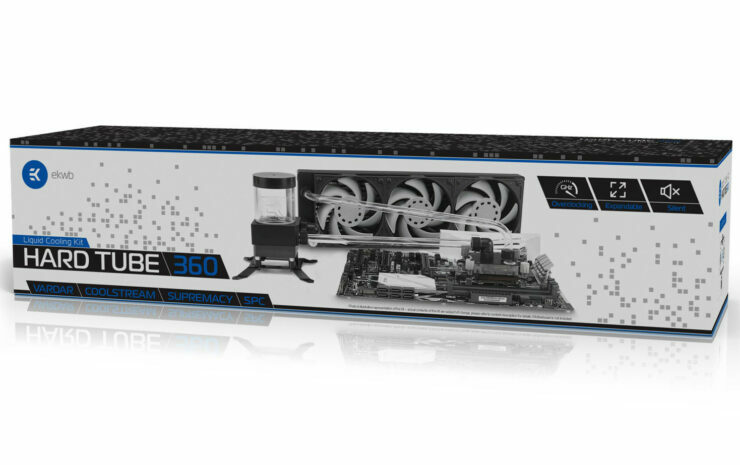 The benefit of this is most of the components are pre-assembled allowing for a quick ans simple installation procedure and is a full custom loop that can still be upgraded with additional GPU blocks, or additional radiators. EK also recommends you install the EK-HD Tube D.I.Y. Kit 10&12mm and EK-HD Tube Reamer tools. If you are building your first hard tube based loop, EK recommends that you purchase additional EK-HD Tube 10/12mm tubing since hard tube bending can be a trial and error based task. For easier tube routing and more sleek aesthetics, EK EK recommends that you purchase additional angled adapter fittings.